In March 2014, President Obama directed Secretary of Labor Tom Perez to prepare an update of the regulations that govern exemptions from the Fair Labor Standards Act (FLSA) requirement that employers pay time-and-a-half for work beyond 40 hours in a week. The so-called “white collar” exemptions for professionals, executives, and administrators include a threshold salary below which every employee is guaranteed overtime pay regardless of his or her work duties. Above that salary level, the employer doesn’t have to pay anything for overtime hours—not even minimum wage—if the work performed meets certain criteria. So, where should the salary threshold be set? In the past year, four significant proposals have been made. The lowest proposal, for a threshold of $807 per week or $42,000 a year, is rumored to be under consideration at the Department of Labor (DOL). Jared Bernstein and I recommended a simple inflation adjustment of the 1975 threshold: $984 per week or $51,168 a year. In a paper for EPI, Heidi Shierholz suggested that $1,122 per week, or $58,344 a year, was appropriate because it would guarantee that the same share of salaried workers receive overtime protection as were protected in 1975—after adjusting for the different educational composition of the workforce today. The highest figure, proposed by Nick Hanauer, is $1,327 per week, or $69,004 a year. It represents the salary level that would cover the same share of salaried workers as in 1975, but without adjustments for changed demographics. 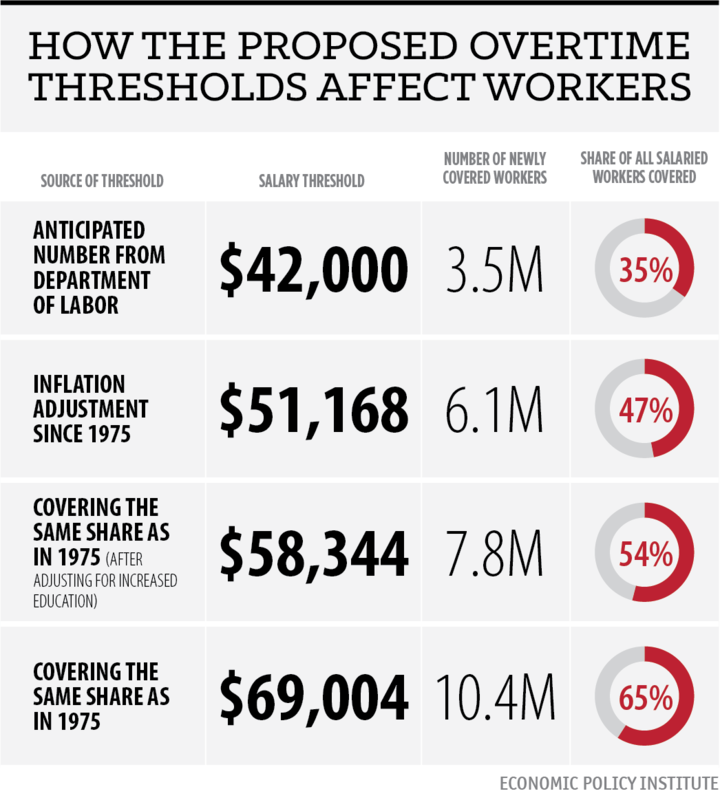 The figure shows that as the threshold increases, millions more employees are guaranteed overtime coverage.